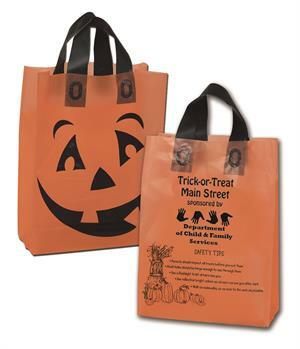 Our Frosted "Jack-O-Lantern" Trick-or-Treat shopper bag is 10" x 13" + 5" gusset and has black loop handles. This bag is smaller than our #953BH poly Jack-o-Lantern bag but the wide 5" gusset means it can hold more candy. If you are looking for a Halloween bag with a large imprint area, this is the trick-or-treat bag for you! This bag has an LARGE 4.5" x 5" imprint area on the back. Price includes printing in black on the back of the bag. Free window poster with any order of Halloween Bags. For orders of 5,000 or more, please call for a quote. This item replaces our discontinued 958WJ. For logos: Add a set-up charge of $60.00. Please add the plate charge to your shopping cart in the RELATED PRODUCTS area below. Click here to email your logo. 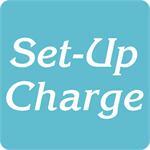 For orders that require a set-up charge of $60.00.